Prepare yourself: There will be no mention of Erik Karlsson beyond this point. There are concerns in Teal Town and with good reason — some higher on the national radar and some that have escaped notice. Jones’ best season with the Sharks thus far was his first. His playoff performance this past season was unremarkable and his preseason was sieve-like, although the team as a whole was out of sync. I have to imagine he set a record by giving up 4 short-handed goals to the same team during a preseason, in two separate games against the Knights — three in one game. Certainly this is a team failing, but a goalie on his game is stopping at least one of those. 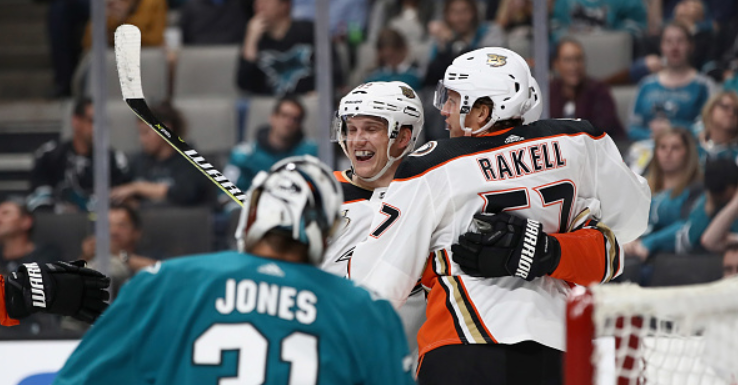 It’s not often that you can lay a loss entirely on a goalie, but the Sharks’ first game against Anaheim is clearly one of those. Any team facing only 14 shots over an entire game better darn well win. Facing more than double the shot total, John Gibson was at his best, stopping 31 of 32. But if Jones’ .714 save percentage is a predictor of his season, all the blue line superstar power in the league won’t matter. Signing his big contract in Nov. 2016, Burns went on to capture the Norris trophy despite some controversy over his end-of-season slump. The next season, 2017-18, his goal total dropped from 29 to 12. During the 2018-19 preseason and regular season’s first two games, we have seen a Brent Burns who looks confused and uncomfortable, new to the team and in some ways, new to the position he plays. Since I promised not to mention a certain newcomer to the team, I won’t speculate if this addition has unsettled Burns or what, but if the Sharks are to meet most people’s expectation as a Cup winner, he’s going to have to settle down. Joonas Donskoi and Melker Karlsson together represent a concern. In their first campaigns with the Sharks, these two were visible for their inability to stay strong on the puck; it seemed in any puck challenge, they were knocked off and usually down to the ice in the process. Sure, everyone lauded their ability and grit in popping right back up like whack-a-moles, but still — if you can’t retain possession, what do you have in the end? Not the puck. Last season, they both brought a stronger puck management game. Donskoi notably got tougher to edge off the biscuit; this season, however, and granted the small sample size, he seems right back where he began. Donskoi and Karlsson are those key “depth guys” every winning team needs; they do so many little but important things, but if he and the “Melk-man”can’t address this part of the game, the Sharks might be dead in the water. By all accounts and accomplishments, DeBoer is a fine coach. But he’s got folks in Teal Town worried, and with good reason. Having a preseason to take one of the league’s best rosters and establish some chemistry, some lines, some power play success or even some PK success, it seems he was able to do none of these. It’s largely a question of personnel management: can he recognize the right fits? Will he try the right guys together on the right lines, in the right situations? Does he trust the right guys to coach his units? And in the end, is he going to waste what might be a short stint with one of the world’s greatest hockey talents?